Two women's bouts have been added to UFC Fight Night 125 Feb. 3 Manguiernho Gymnasium in Belem, Brazil. This will air on Fox Sports 1 in the US and TSN in Canada. 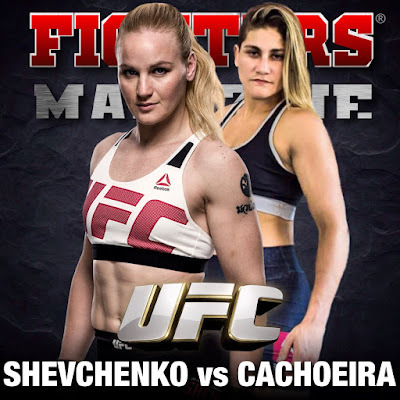 The first match at Flyweight is Valentina Shevchenko vs Priscila Cachoeira which will be on the main card. The second fight at Strawweight has Maia Stevenson vs Polyana Viana which I expect will air on the UFC Fight Pass prelims. Of course many fans think Valentina should get the first title shot. Now, she hasn't said that. She knows she has to earn it. It's not a slam dunk. She'll be the favorite in this fight. I'm just not as high on her as some. I think she's a one dimensional kickboxer. And she looked terrible against Amanda Nunes. Priscila was supposed to make her UFC debut on the TUF 26 finale but she had visa problems. Her record is 9-0. She trains at PRVT so Jessica Andrade is a teammate. She has won several fights by TKO. I guess like any fighter from the Brazilian regional circuit, this is a big step up in competition. Valentina will be a good test for her. Maia was on TUF 26. She lost in the first round. She's 35 years old with a 6-4 record. I don't think she has ever beaten anyone who has won a fight. I don't think she belongs in the UFC. Oh and she's married to Joe Stevenson. So I guess it's not what you know. It's who you know. Polyana is 26 years old with a 9-1 record. She trains at Tata Fight Team so she is a teammate of UFC fighter Alex Oliveira. She's a former Jungle Fight champ. But the UFC is still a big step up in competition though I don't think Maia is a UFC caliber fighter. So we're talking about a couple of unknown Brazilian fighters. We'll see if they are any good.